Losing sleep over how you are going to do in the exams? Want to know what your future has in store? Let's see what the cards have in store for us today. It’s that time of year again fellow Hogwarts students and staff! As tomorrow marks the start of Exam Week on WoP, this edition/first edition will be focused on hard work, determination, and that examination result that we all wish we could know before falling asleep tonight. 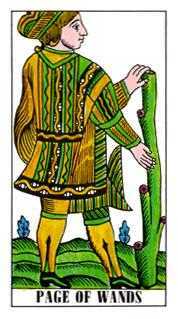 Whether you are all pumped up and ready or wondering if and how you can survive in the outside world without adult supervision, try taking a look at your tarot card horoscope and see if the cards have any last minute advice before you walk through that door tomorrow morning. Even though I am not a Seer, I will try my best to make predictions as good as using astrology. 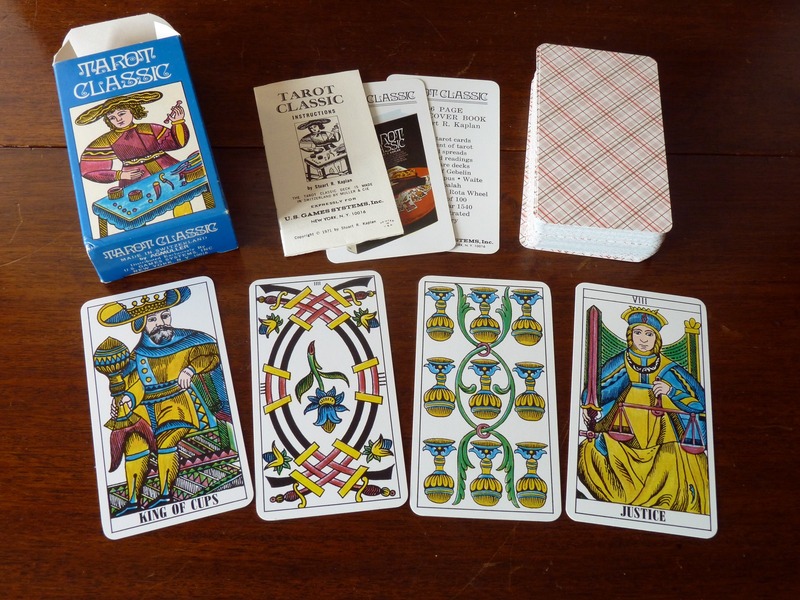 Today, in spirit of exam week, I will be using the Classic deck. 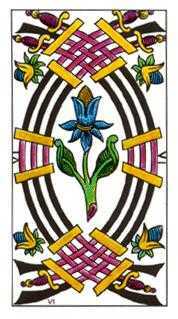 You are about to start the first step in achieving your end goal as symbolized by the ace. Wands signify that there will be changes within you that may or may not sway you from your end goal. Stay focused on your exams even if there may be tempting lures for adventure. You are about to start the process of reaching your lifelong dream whether it be a career or something else. Even if you feel your morals change, keep your eyes on that end goal. A challenge is standing in front of you and in order to undertake it, you must have a new perspective of the situation. Study for your classes as if you are just learning the topics and think about those exams as a new adventure for you to embark on. Form study groups with your friends to share new ideas and help prepare yourself before you walk through the doors. 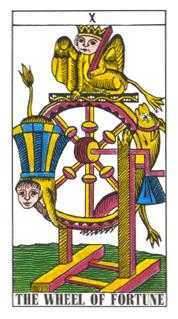 The Wheel of Fortune in this position hints that there will be an unpredictable change. Maybe it is an exam question that you haven’t studied or an incident that disrupts the examination. Don’t be bothered with trying to figure out all the worst case scenarios on exam day. Instead, take that famous advice and just go with the flow. You can’t change the future so spend all that strength and energy into adapting to the change. Deep down underneath that coolness, you are yearning to be able to help out your friends before the exams. 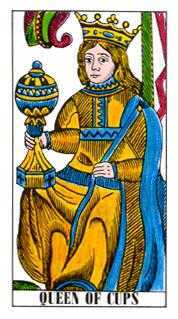 The Queen of Cups symbolizes having a strong concern for others. Help out your friends by forming study groups. But just keep in mind about your own studies too and not get too carried away with focusing on others. Although somehow I get the feeling that it won’t be too difficult. An upright Moon symbolizes powerful but false beliefs from people around you and nothing seems like it used to be. This might mean the hecticness of exam week or your friends are studying the wrong exam materials or even just the common case of overconfidence. Do not try to change your surrounding people’s beliefs. For now, put all your ambitious focus into your own studies. What happens will happen and you need to make sure that you can get through the exams safely before putting your focus elsewhere. 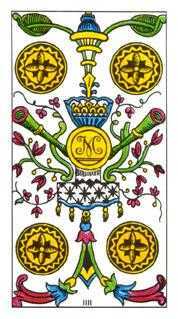 The Six of Swords in this position challenges you to examine the technical aspects of your current situation. Logical, rigorous analysis will empower you now, substantially clarifying important issues. When unseen patterns become visible, you will realize with surprise that they were active all along. You have to first reorganize your mind in order to clearly see factors you usually take for granted. Don't wait for someone else's solution. Reach deep into yourself and confirm that you have what it takes to figure this out. If you study the situation, you will know what to do. 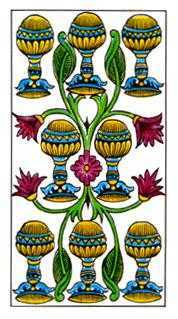 The Eight of Cups symbolizes that you have recently exposed some sort of vulnerability like a new side of you or a sense of imbalance. Do not lose yourself in self-pity and use that hard work ethic to push through this turmoil. Even if it seems like all hope is lost and you will never get that Outstanding, pick yourself up and work hard for that goal; don’t just do nothing and give up. By going through this struggle, you will gain greater strength and wisdom for your next year or the start of your new life outside of Hogwarts. 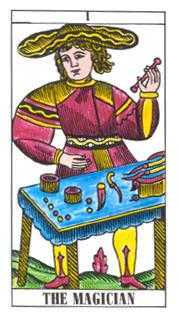 The Magician represents knowledge and imagination. Your situation looks pretty good right now. You’ve been studying pretty hard over the course of the year (or have been really lucky) and are now approaching the final step. Whether you have or haven’t been studying all year, this is a great time for you to surround yourself with people more knowledgeable than yourself from studying with your smart friends or asking the professors for help. With all this knowledge, you are bound to ace that exam! 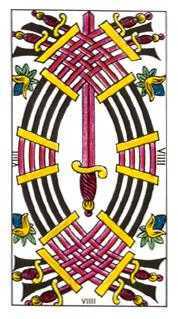 The Nine of Swords hints that there might be a catastrophe in the near future. Again, I would like to say that this by no means mean that you will receive a horrible grade on an exam. 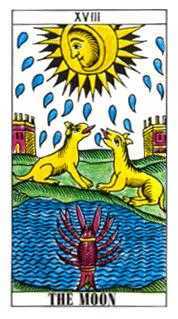 However, if you do find yourself in such a situation or something likewise, do not be sad; the Nine of Swords also hints that this seemingly horrible situation actually prevents an even worse situation from occurring. So if at the end you received a failing grade in say, Herbology, then now you know that Herbology is not the subject for you and be able to take a different you might do better in next year. Be optimistic! 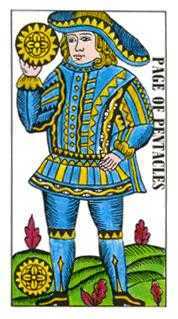 An upright Four of Pentacles suggests that you have just recently been blessed with an inheritance or support and you are still trying to figure out how to use it well. Maybe someone close to you has the ability to help you excel in the exams or you were lucky to find the perfect study material hidden within the Hogwarts library. Use this newfound support as a foundation of your studies and a mode of advice before you walk through those doors tomorrow. 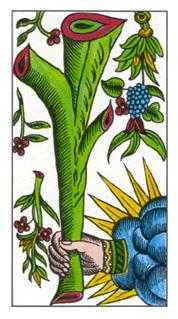 The Page of Wands hints a great change in your situation. This could be some sort of unpredictable news or event that may disrupt your everyday life or that exam question you did not think to study for. Be prepared for anything but make sure that you don’t stress yourself out trying to remember every word in the textbook. Just be prepared enough so that any kind of change will not catch you by surprise. Great news! 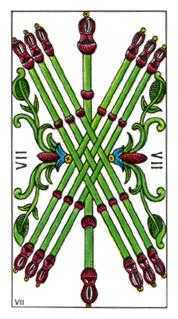 The Seven of Wands represents that your current performance will surpass all your past performances. Maybe this year you will finally have a clean streak or reach your end of the year goal. Finally, all those night long studying and reading ahead have paid off. While you are experiencing this success, you may come across a feeling of competitiveness or rivalry between you and your fellow classmates. Try not to focus too much on comparing yourself with others. This is not the time to be that know-it-all. What matters is that you have reached your personal goal. Just a reminder though, this is only a possible end result. Do not be overconfident! Thank you for reading this edition of Your Tarot Reading. To all my fellow student readers out there, eat a nice supper and get a good restful night of sleep. Personally, I feel that dressing up for the occasion on exam days boosts your confidence and state of mind so if you feel awesome wearing that dress robe, wear that dress robe! Remember that with hard work and confidence, you can get that elusive Outstanding grade. You got this everyone! Lucy Tremblay I absolutely love this! SunHi Rutherford I hope so, do one once a month. Its a great read. Hazel Green Nice one, Hannah! Didn’t know you did tarot reading! Are you gonna do these next year?